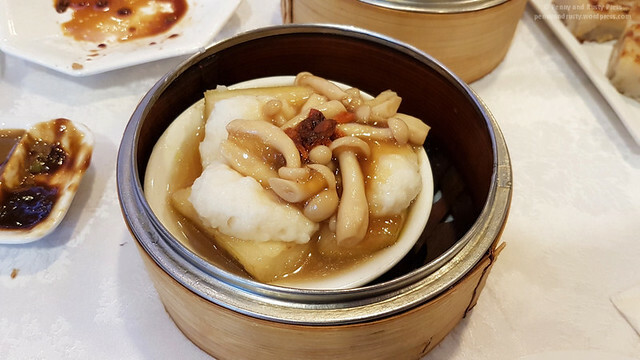 Due to the large number of dim sum restaurants in the area, it’s not unusual for us to go for years before returning to a restaurant that we’ve previously tried before… even one that we’ve quite enjoyed. Sun Sui Wah used to be one of the more popular dim sum restaurants in Vancouver/Richmond (they have locations in both cities) but I had heard that the food quality had declined recently. Still, we wanted to see for ourselves so we visited their Richmond location in mid-September. 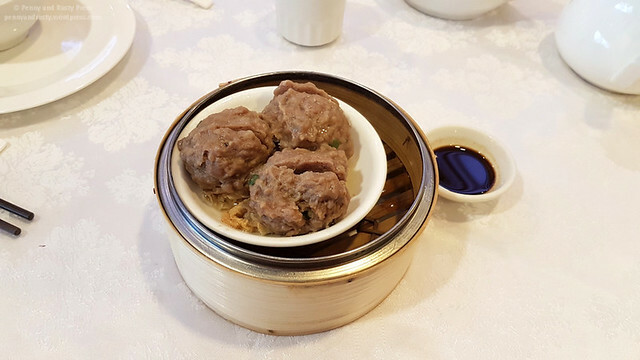 Steamed Beef Balls ($4.50) was always a favourite as a child as it’s a fairly simple dish. 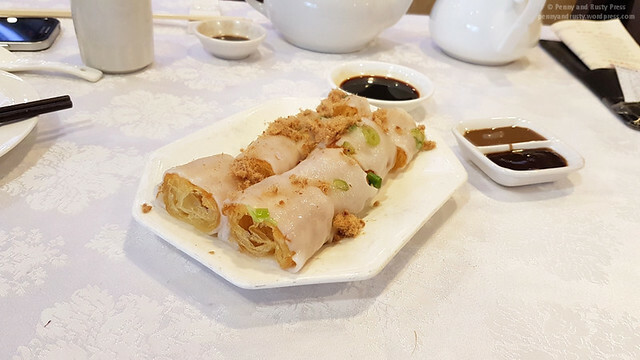 Similarly, the Chinese Donut Rice Roll ($5.50) is popular due to how fun they are to eat and the mixture of soft and crunchy textures. We wanted to try some dim sum dishes that we’ve never had before so this was the Steamed Mo Qua with Fish Paste ($5.50). 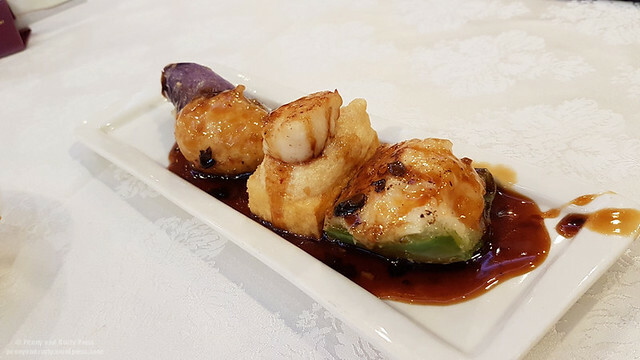 The mo qua (a type of squash with a delicately sweet flavour) was firm and absorbed the flavour of the sauce, which was also served with mushrooms. This next dish was my fault because I thought that Mushroom Siu Mai ($4.50) sounded interesting. 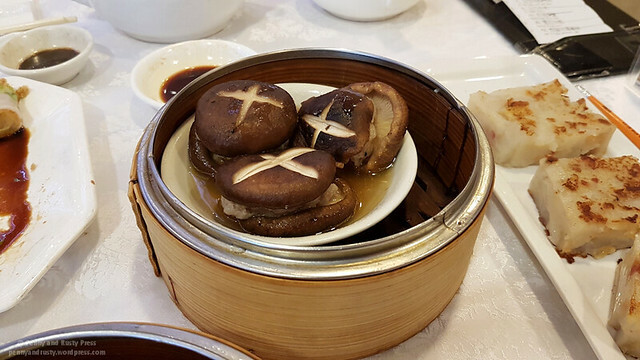 I had thought they meant that the filling had mushrooms in it but, as it turned out, the pork and shrimp filling was sandwiched between two shiitake mushrooms. Honestly, this wasn’t that great. 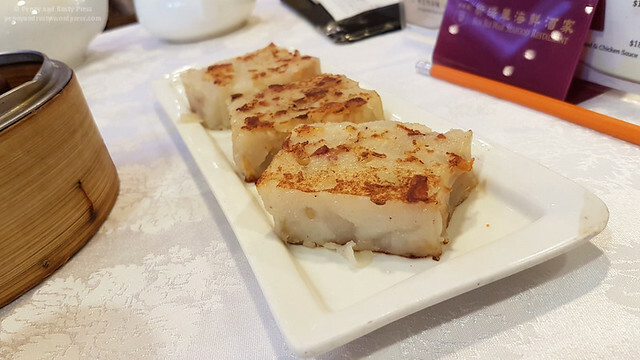 Fortunately, the Pan-Fried Daikon Cake ($4.50) was much better. The lo bak go had little bits of Chinese sausage embedded in it and wasn’t the least bit dry. After seeing some of the dishes that the other tables were ordering, we made a point to come back a week later to order some of those dishes. The traditional Pork and Shrimp Siu Mai ($4.50) was much better than the mushroom version that we had last week. 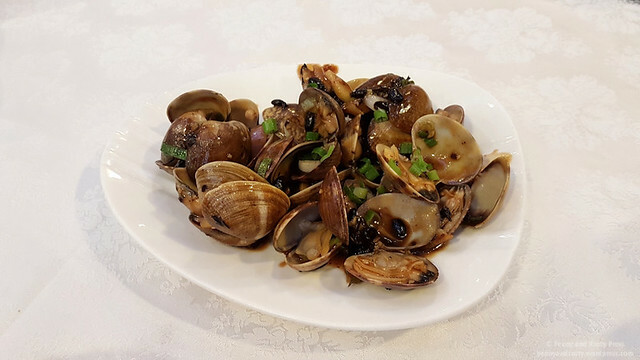 Next up was the Sautéed Clams in Black Bean Sauce ($8.00). Speaking of black bean sauce, we also ordered the Tofu, Eggplant, and Green Pepper with Fish Paste and Black Bean Sauce ($5.50). I really enjoyed this dish! 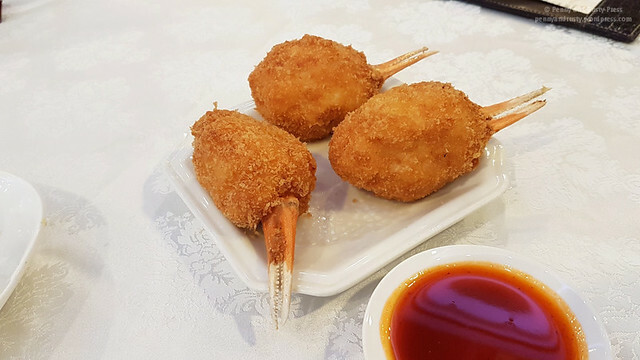 On our last visit, we had considered ordering the Deep-Fried Crab Claw with Shrimp Paste ($5.95 for 3 pieces) as we usually only get deep-fried crab claws at special dinners. Even at the restaurants that offer it as a side dish tend to charge $5 per claw so we thought these claws would be super small. As it turns out, they looked pretty much like the real deal. I suppose they keep the cost down by substituting cheaper shrimp paste within the filling. In either case, they were served with a sweet and sour sauce and were pretty tasty! The Mango Pudding ($3.95) was served with a sticky almond-sliver cookie which stuck to my teeth. 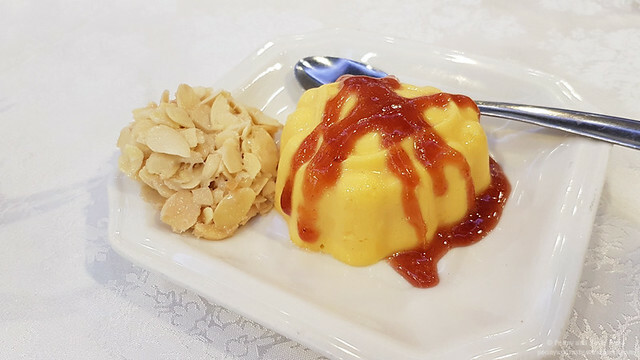 Honestly didn’t need the drizzling of sweet red jam-like sauce on the mango pudding. 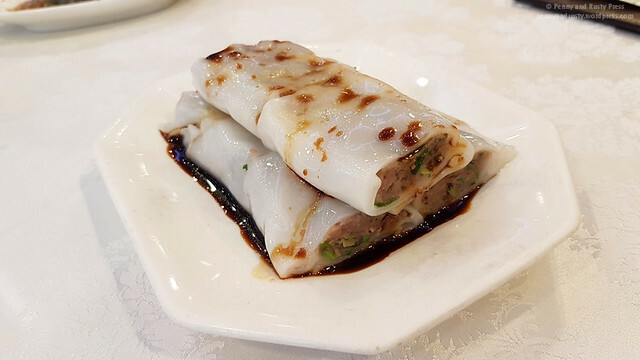 Our Steamed Beef Rice Rolls (5.50) was the last dish to arrive and were well formed with a meaty filling enhanced with parsley. Overall, there are some good and bad dim sum dishes here but I felt I was pleased with most of them. If you want to avoid the dim sum rush, make sure to come before 11am as it tends to get busy after that. 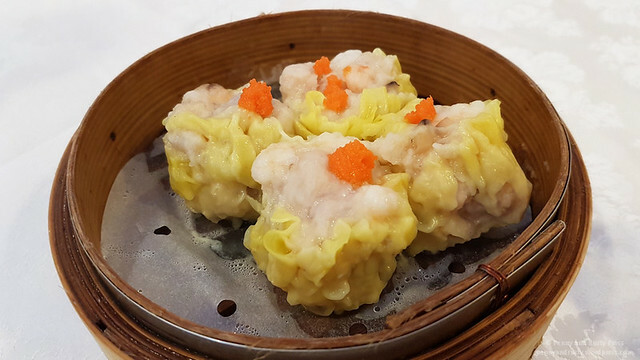 Posted on November 26, 2016, in Chinese, Dim Sum, Restaurant Review and tagged Beef Rice Rolls, Central Richmond, Chinese, Clams, Dim Sum, Food, Mango Pudding, restaurant review, Richmond, Siu Mai. Bookmark the permalink. Leave a comment.